We started in NYC where the highlight was catching up with friends, finding real food and exploring Museum of Modern Art. We sat drinking good coffee, one being from Stumptown Coffee Roasters www.stumptowncoffee.com, talking about recent adventures and reconnecting as we updated where we were at with exploring our passions, the demands of life and what lay ahead in 2015. We walked through a farmers market, looking at local produce until I found a ferment stall to check out. It’s all so simple but really special to see local produce and variations of sauerkraut, brined vegetables, pickles and sauerkraut juice. It was interesting to note that where I live I preserve autumn cabbage for health reasons and because I like it, but in many parts of the world it was done as a survival strategy and just a part of the diet. You preserved the abundance to enjoy later. So, with large volumes people would come together to ferment or preserve so the work was shared, skills and traditions were passed on. It sounds pretty good to me! And…. if you didn’t preserve it then over the winter it was not going to be available to eat! I searched wholefood stores to see what was or was not available and found that Bragg’s make an apple cider vinegar drink that I’ve not noticed at home. Mmmm…..I had expected to see a lot more Kombucha but it was milk kefir or drinking yoghurt that had the diversity of offering instead. 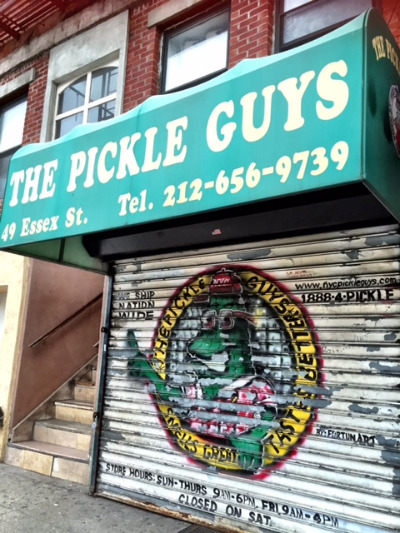 We ate simple food, walked and chatted more with friends about food, experimenting, kitchen bench space and came so close to seeing The Pickle Guys store but alas, being Saturday, it was closed. Oh well, not to be. The next destination was Krakow, Poland with its significance for family heritage, its Christmas markets and food stalls and the magnificent salt mine. There was so much to see as we walked the side streets, town centre and up to the castle. Mulled wine was a comfort food in the late afternoon but no two ever tasted the same and I think we tried steak tartar each time we saw it just to see how it was presented. Most were really yummy. I was so shocked in the markets when I found a crock full of cut horseradish root. At home this is $100/kg and there would have been at least 3 kg just sitting there as a display item. I spoke to the stall owner about my fascination with horseradish for Master Tonic or Four Thieves Vinegar but she’d never heard of them but she loved the thought that she was rich! She was in my eyes. The visit to the salt mine was amazing. (www.kopalnia.pl/) We walked underground for more than 2 hours but only saw less than 1% of the mine. It was huge and in its time brought trade and wealth to the town in an era when salt was revered for its preserving and flavour enhancing qualities. But the mine closed in the late 1990’s and now extracts wealth from the tourists that visit its vast underground tunnels. It is so well worth a look. After Christmas we headed to Paris which also highlighted the importance and sheer pleasure of shopping fresh each day. I loved my new routine of heading out for a morning coffee, picking up a croissant to munch on, then a baguette, some greens, eggs and bacon for breakfast. I liked the bacon! It took so little time to start to chat to the store holders each day, see what was new and try something different. This was especially true of our local cheese shop, Griffon Fromager Affineur, that was so good, so tasty, so raw, so much mould and so much variety. Ahhhhh, yum. The art was fantastic all over but it was not to the enjoyment of everyone in the family, but we learnt this along the way and adapted the plans accordingly. My favourite piece in Paris was a ceiling installation that reminded me of my bubbly ferments. I’d have missed it completely except that I was asked to look up, it was like asking me to try something new, and it just made me smile. Happy 2015 and may you find something new that makes you smile.